What do you want to see in iMore app 3.0? iMore for iPhone version 2.0 only just launched but we're already in the early stages of work on iMore app 3.0 and one of the very first things we wanted to do was ask you, the iMore community, what you want to see? We'll be doing some obvious architectural things, like switching from Drupal-based authentication to our awesome new Mobile Nations Passport system, and moving things like text size selectors to a dedicated settings screen so your choice persists once you make it. But we'd love to hear from you on some of the other options. For example, would you like to see an iPad interface? iMore is a website and the iPad has a great, full-sized web browser, so would an app version of the site really make a big difference to you? Would things like the favorites, podcasts, and tab-based sorting make your iMore-on-iPad experience better? Search is something else that we get a lot of requests for. However, we wouldn't want to cache the entire 5+ years of iMore on your iPhone, so that means web-based search is the only practical alternative, and again, is that something that's better done in the browser? We currently push comments off into a second screen so loading them doesn't slow down the main article, but is that convenient for you, or just one extra tap too many? What about the iMore Forums? 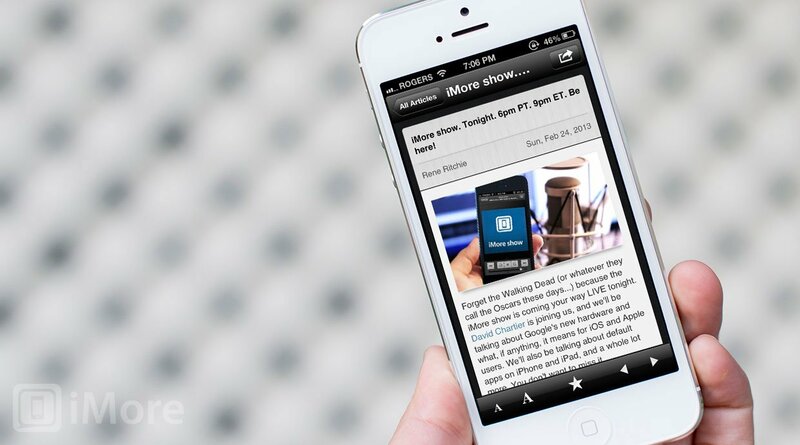 Right now they're in a separate app, but would it better for you if we bundled them together into one super iMore app? What about the overall design? Is there anything we could do there to make your experience better? iMore, Nickelfish, and everyone at Mobile Nations is dedicated to making the next version of the iMore app absolutely the best ever, so let us know -- what do you want to see?